Hailing from New Zealand, Trepanation have unleashed violent visual chaos to support their upcoming split with fellow countrymen Sabbatic Goat. 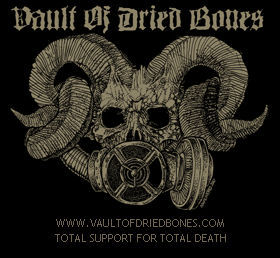 Vault Of Dried Bones will be handling the cassette version this coming winter while Iron Bonehead Productions and Black Chaos Productions will co-release the 7″ EP version later this summer. This entry was posted in News and tagged cassette, chaos, death metal, grind, iron bonehead, new zealand, sabbatic goat, split, strike, total death, trepanation, vault of dried bones. Bookmark the permalink.